Tonight's guest was paranormal investigator Rebecca Brumble, who works as a member of the Board of Directors of/at haunted Fort Mifflin. Sjype was being mega uncooperative with my connection throughout the show. Rebeccas provided a history of the fort, as well as much of its layout. She also discussed her own history with the place; attending a paranormal event evening. That first time, not very much was experienced, but since then her frequent presence had her Better Known to its incorporeal inhabitants, so since then she has not been disappointed. Rebecca spoke about some of the Paranormal Activity that takes place, such as the screaming lady, which can be loudly heard from almost every aspect of the fort, except for One Room; the Unknown Tour Guide, a soldier who showed up a pre-digital photo; the self-opening Blacksmith's door, as well as seeing him as a full body apparition; residual hauntings of marching soldiers, cannon fire; etc. More recent staffers come to Rebecca to impart their experiences. Some ghosts apparently take shines to specific living staffers. After the second break Ceiling Cat Barbara Duncan reported our having listeners tonight in the US, the UK, Canada, Australia, and unknown. Rebecca and I agreed our mutual meh about how Ghosthunter type TV shows hype up hauntings, as though investigations are terrifyingly exciting, as opposed to the mostly walking around in the quiet dark. She spoke about a group that more there for a scare than the experience. Rebecca spoke to one of the ghosts known as The Judge, indicating little to no Activity, and as the Judge likes to "mess" with people, she essentially requested him to Do Something. Unfortunately, he took her to task at that. A massive wodden door could be heard slamming shut with a vengence, considering there are no wooden doors there any more. Rebecca also ended up having her head pulled back, and getting all but punched in the face during all this, by someone unseen, the next day raising a major street-fight level black-eye. Henry played a few of the EVPs Rebecca has acquired over the years. The first was the voice of William Howe, in Casemate 11 telling the normally verbose Rebecca to "Don't Talk." Next, in the empty officer's quarters, Scott and Rebecca walked into the room and shut the door, at which point, a Voice says, "Over here, son." Henry played an EVP he once got at Mifflin, far more whispery than the Class A that Rebecca's EVPs. 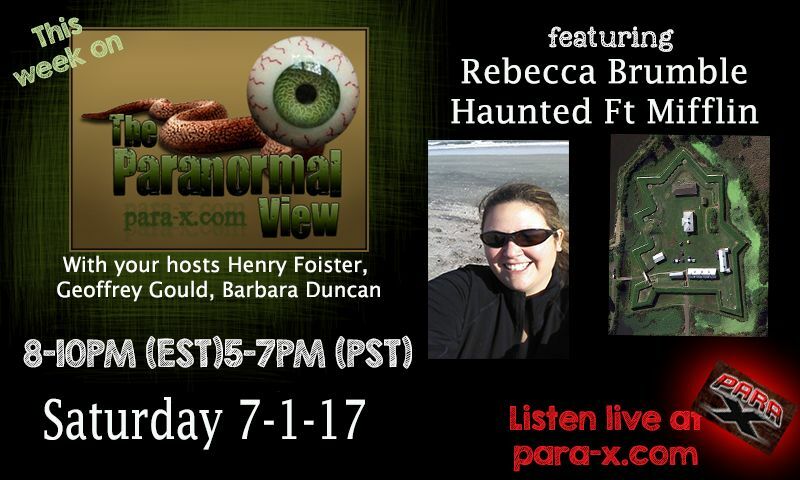 Henry had Rebecca convey the information on the upcoming Para-X September 16th Horror at the Fort ghost fest event. The nighttime investigation will be limited to only 40 people. $45 for the All Day; $10 for just the day 10am-4pm. We had Rebecca cnnvey the origins on her interest and fascination of the paranormal. Her indicated being clareaudient, so she Hears ghosts more than Sees them. She also spoke about her investigation team, and its evolution thereof. Sherri in the chat room asked about anything Following Rebecca home; the ghosts of Fort Mifflin are very loyal to the fort, so they stay put. CC credited Rebecca with the full update of the para-x website. 01 July 2017 edition of The Paranormal View.